Talking about insurance can often be an uncomfortable topic. The very nature of insurance requires healthy, happy individuals to think about a future where they may be faced with life-altering challenges. However, like many uncomfortable discussions that come up in life, talking about disability insurance is incredibly important. There is a notion that disability insurance is an unnecessary added cost, only for people in certain jobs, or only for people with no insurance to begin with. There are a lot of myths surrounding disability insurance that convince people to forego one of the most valuable insurance policies available. We want to break down those myths, expose the truth, and reveal why disability insurance is more than just an add-on available from your insurance provider. This is one of the most common things said when the topic of disability insurance comes up. A number of people have some sort of disability insurance offered through their work benefits so why would they ever need to purchase additional coverage? The truth is that disability coverage offered through most work plans is simply there to cover basic expenses. People often find out that this coverage is insufficient after it’s too late. Taking the time to do a simple budget using disability benefits can be a very revealing exercise. Trying to cover all of life’s expenses on disability benefits that amount to 60% of a full salary can be difficult or even impossible. That doesn’t even take into account special care needs or expenses related to disability. The sad truth is that many people receiving disability benefits quickly discover they can no longer manage vehicle payments, mortgage commitments, and other lifestyle expenses. When people hear the word “disability” they often think about physical injury. 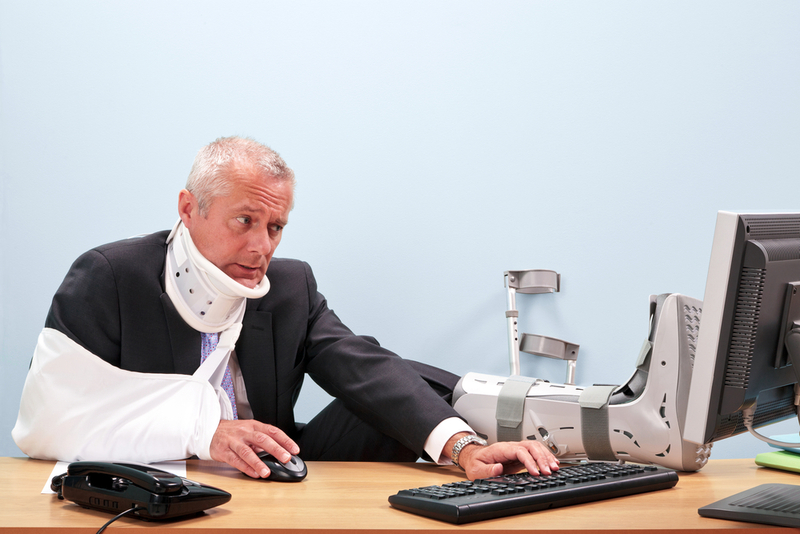 An accident or injury on the job is far less likely to happen to someone who sits in an office at a desk all day, right? While that may be true, physical injuries only make up a portion of disability insurance claims. Serious illness often goes overlooked as a major cause for disability insurance claims. In fact, illness and medical bills account for 62% of all bankruptcies in the United States, according to a Harvard study. People may have less risk of being injured based on their job description but illness does not discriminate between white collar and blue collar workers. Many people think of insurance coverage as an expense to protect against rare occurrences. For instance, most people drive their vehicle to and from work every day without any accidents. Vehicle insurance is there to protect drivers when that rare collision does occur. Using that same logic, people assume disability claims must be even rarer than auto insurance claims. After all, the government mandates people to have auto insurance so if disability claims were common then that would probably be mandated too, right? The truth is that disability claims are, unfortunately, very common. Depending on what part of America we look at, around 1 in 5 people will be collecting disability at any given time. Some estimates suggest that more than half of all eligible Americans will make a claim at some point in their life before age 65. Chances are that everyone knows someone who has suffered a significant, long-term injury or illness that caused great strain on their life. The financial hardship that accompanies such a stressful time is at least something that can be planned for. Many people are smart with their finances and set aside a small emergency fund to get them through a short period of difficulty. These people will be able to make their mortgage payments, pay the utilities, and buy groceries even if they miss a few weeks of work due to injury or illness. The issue is that disability claims rarely only last a few weeks. In fact, 1 in 3 people will spend at least 6 months collecting disability benefits. That’s 6 months of paying bills, covering healthcare expenses, and attempting to maintain some semblance of normalcy in the face of serious illness or injury. As people try to manage their disability over time, they will often begin dipping into savings. This could mean ultimately putting off retirement or having to change plans for the future to account for the lost savings. A few weeks away from work may be inconvenient. A few months away from work could be incredibly difficult. Years off of work could seem downright impossible. Assuming that disability benefits will only have to cover a short-term illness or injury is not always correct. Different people have different opinions on the value of services. This is especially true when discussing insurance because there is no immediately clear benefit to insurance. Rather, insurance is an investment in the future that you hope you will never have to use. Cost is subjective and we will not argue that fact. However, disability insurance is often a minor expense when compared with the stress of managing bills, loan payments, and regular expenses during an extended disability situation. We have only scratched the surface of disability insurance. The benefits of having this incredibly valuable protection are countless. Don’t wait until it’s too late. Find out how disability insurance can fit into your life with an in-depth conversation about your unique needs, lifestyle, and goals. If you want to learn more about protecting your family, your business, and your home during a crisis then reach out to us at Mooney Lyons today. We’re experienced in helping people plan for every aspect of their financial future.